When the D-Day forces landed, Hitler was asleep. None of his generals dared send re-enforcement's without his permission, and no-one dared wake him. Hitler believed he was attractive to women, so he remained single for political gain. The German people were unaware of Eva Braun until after the war. 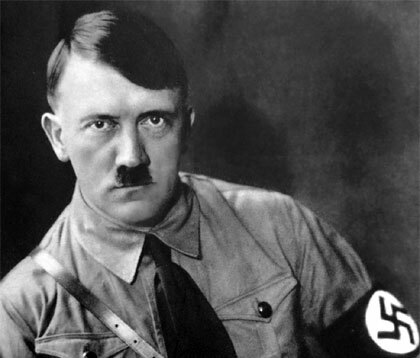 During Hitler's years in power, his book "Mein Kampf" was given away for free to every newlywed couple. Hitler never learned to drive. Yet, he spearheaded the development of the Volkswagen car. In 1913, Hitler, Stalin, Trotsky, Tito and Freud all lived within a few miles of each other in Vienna, with some of them being regulars at the same coffeehouses. Both Adolf Hitler and Osama Bin Laden were announced dead on May 1. In 1938, Hitler was TIME Magazine's Man of the Year. There was a Jewish-Austrian doctor who didn't charge Hitler's family due to their economic hardship. Hitler had him protected and called him "Noble Jew". Hitler was saved from drowning by a priest when he was 4 years old. Hitler was a Vegetarian and created laws against animal cruelty. Hitler only Had One Testicle. Hitler suffered chronic flatulence and took 28 different drugs to fight it. Adolf Schicklgruber would have been Hitler's name. His Father changed his last name in 1877. Hitler's first Love was a Jewish Girl. Lacking courage, he never spoke to her. Albert Einstein denounced segregation, calling it a "disease of white people" and worked against racism in America. Galileo Galilee was Albert Einstein's favourite scientist. Albert Einstein's brain had a parietal lobe that was 15 % larger than the average brain. Albert Einstein didn't like to wear socks. Albert Einstein had no car of his own and he also never learned how to drive. Austrian physicist Friedrich Hasenohrl published the basic equation E = mc2 a year before Einstein did. Einstein had an Illegitimate Daughter born in 1902. Einstein was famous for having a bad memory. He could not remember names, dates and phone number. Einstein never received a Nobel prize for relativity. It was actually for the photoelectric effect. Einstein failed his University Entrance Exam and had to reapply a year later. Einstein was a slow learner as a child and spoke very slowly. Albert Einstein considered himself an agnostic, not an atheist. Einstein's great breakthroughs came from visual experiments performed in his head rather than the lab. The only thing left on Bill Gates' bucket list is not to die. At a spending rate of $1 million a day, it would take bill Gates 218 years to spend all his money. Bill Gates pays over US$1 million per year in property taxes for his house. $28 billion dollars were donated by Bill Gates so far. Bill Gates SAT score was 1590 out of 1600. Bill Gates continued to fly coach until 1997, when his net worth was already US$36 billion. 6 million lives were saved by Bill with vaccines and better healthcare. In 2004, Gates predicted that the problem of spam email would be gone within two years. Bill Gates was arrested in New Mexico in 1977 for jumping a red light and driving without a licence. Bill Gates aimed to become a millionaire by the age of 30. However, he became a billionaire at 31. Bill Gates' children will only inherit US$72 billion net worth. If Bill Gates was a country he would be the #63 richest on earth. In 1948, David Atchison became President of the United States for just one day, and he spent most of the day sleeping. John Lennon sometimes liked to sleep in an old coffin. Hitler had a portrait of Henry Ford behind his desk, regarding his as an "inspiration". Charles Richter, who invented the Richter Scale, was a nudist. The first mobile phone call was made 1973 by Martin Cooper, a former Motorola inventor. In 1941, Henry Ford made a car out of soybeans. Ralph Teetor, inventor of the cruise control, was blind. No U.S. president has been elected after being divorced except for Ronald Reagan.